Florida All-American Melanie Sinclair's 10.0 on the uneven bars led the No. 5 gymnastics team (3-1, 2-1 SEC) to a 195.925-193.85 win Friday over Kentucky (1-3, 0-3 SEC). 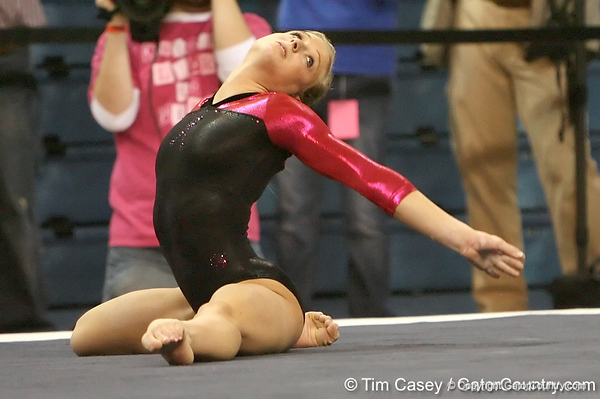 It was her second 10.0 wearing pink, as her first perfect bars mark came in 2007 when Florida played host to its first Gators Link to Pink event on Feb. 16, 2007. She is the fourth Gator to earn the perfect mark on bars and the only one to post a 10.0 on multiple occasions. UF junior Maranda Smith set her collegiate bars best to share second overall with teammate Corey Hartung at 9.90. Florida started off the meet with strong performances on vault and bars. The Gators also saw their season-high individual vault mark move to 9.95 tonight with Smith’s performance on the event. Since joining the competitive vault lineup for the Gators’ second meet of the season, Smith had led UF on the event. Her collegiate-best mark gave Smith her second vault title of the last three meets. Freshman Elizabeth Mahlich matched her collegiate-best of 9.85 to share second on the event with Sinclair. A crowd of 8,019 – the fifth largest in UF gymnastics history – were on hand for the Third Annual Gators Link to Pink meet. This meet is part of a Southeastern Conference initiative and all of the league’s teams will participate in a breast cancer awareness meet this season. More than 150 breast cancer survivors were at Friday’s meet and one shared her story with the O’Connell Center crowd. The Gators wore leotards with the breast cancer ribbon on the front and deep pink sleeves while many of the fans also wore pink to show their support of the cause. Hartung picked up her first balance beam title of the season, matching UF’s season-best mark of 9.90. It was the 15th beam win for the three-time All-American on the event. But for the second consecutive meet, Florida was forced to count a fall toward its beam team total as no other Gator posted a mark above 9.80 on the event. Sinclair picked up her second event win when she matched her season-best of 9.875 to top Friday’s floor competition. It was her third floor title as a Gator. Smith posted her third top-two floor finish of the season with her runner-up mark of 9.85. Mahlich shared third at 9.825 with UK’s Ferguson. The all-around win went to Sinclair, as she matched her season-best of 39.45 for her second win of 2009 and her fifth as a Gator. Hartung was second at 39.325 and Mahlich took third (39.15). Florida senior Corey Hartung earns a 9.7 on the floor exercise during the Gators' 195.925-193.850 win against the Kentucky Wildcats on Friday, January 30, 2009 at the Stephen C. O'Connell Center in Gainesville, Fla.